This gorgeous blue bracelet is absolutely stunning! If your having troubles with self-expression, or communication this is the bracelet for you. While the throat chakra aids with verbalizing feelings and driving for truthful expression, the third eye acts to keep your intuition and logic on point. 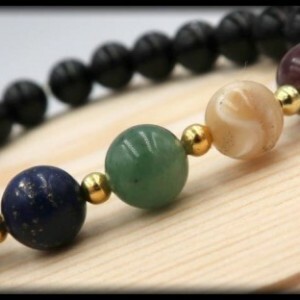 This bracelet is great for releasing old mental conditioning and brings emotional balance as well. Goldstone is known for attracting success and luck. It will help to provide energy, courage, wisdom, and truth. This is the perfect bracelet for empaths! 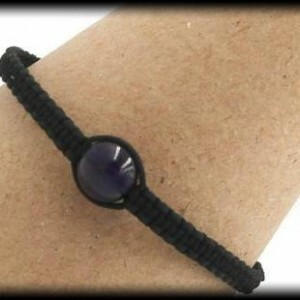 This bracelet is made with 8mm Sodalite and Blue Goldstone. SIZING INFORMATION Please measure your wrist with a measuring tape to ensure the most accurate measurement. If you do not have a measuring tape, you can also use a string by wrapping it around your wrist and then cutting the piece of string. After you have your cut string, place it alongside a ruler and write down your measurement. To ensure a perfect fit, please had 0.5 inch to your wrist measurement, if you want a little room please add .75 inches to your wrist measurement..